N.O.S. 1964 CHEVROLET CHEVELLE MALIBU ELECTRIC CLOCK COMPLETE IN ORGINIAL BOX. 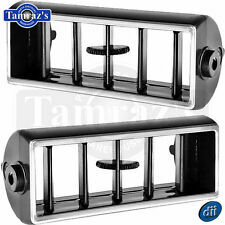 SHOW TO FIT 1965-1968 CHEVROLET PASSENGER (FULL SIZE IMPALA CAPRICE BISCAYNE BELAIR,ETC), 1967 CAMARO & 66 67 CHEVELLE, 1969-1972 CHEVELLE, 1965-1967 CORVAIR, 1970 CHEVROLET. OEM GM A/C VENTS, 2EA ADAPTERS AND 2EA DEFLECTORS. 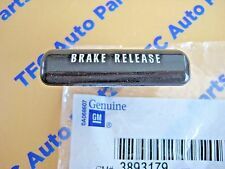 Up for sale is a New Chevy GMC Truck Van Car Parking Brake Release Handle. Good Luck. We strive to earn 100% perfect "FIVE-STAR" scores from you. It is green and in good shape with the mounting bracket. HELLO I HAVE A NOS 1973 THRU 1976 CHEVY CHEVELLE / MONTE CARLO. 1967 - 1981 FIREBIRD - TRANS AM - CAMARO - Z28. 1967-72 Chevelle. 1988-89 Chevrolet/GMC Blazer, Jimmy and Suburban. MAY DIFFER SLIGHTLY FROM ORIGINAL. This is a used 1973-77 Chevy dash bezel for Chevelle/Malibu Classic. This item has normal wear for it's age and has scratches on the lenses (hard to photo), but is free of any major imperfections. Hard to find 1965 Chevrolet Chevelle Malibu Ash Tray. scratches, bondo and other minor or major defects. All used parts are sold as is condition. CAN INSTALL ON TOP OF CRACKED DASH. FIT'S 70-72 CHEVROET CHEVELLE-MALIBU. I HAVE NEVER REMOVED FROM THE BOX & IT HAS NEVER BEEN INSTALLED. I RECEIVED IT NOT IN ORIGINAL BOX. THERE IS NO INSTRUCTIONS BUT YOU CAN GO TO YOU TUBE TO SEE HOW TO INSTALL. CHEVROLET CHEVELLE. Custom Dash Cover Made for. 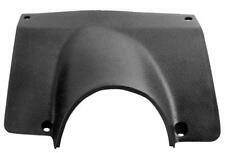 Protect your dashboard with a custom-fit Dash Cover by RZ'S Custom Covers. ALL COLORS AVAILABLE ON THE COLOR CHART. ORDER NOW! We pass on the savings to you. Dash bezel, good shape no cracks. 1970-1972 Chevrolet Chevelle / El Camino / Monte Carlo "SS" Dash Panel. Excellent Reproduction of the injection molded plastic SS Dash Panel for your 1970-1972 Chevelle / El Camino / or Monte Carlo. Chevelle - El Camino - Monte Carlo. 1970 - 1972 Chevelle / El Camino Super Sport models. SS Dash Panel Assembly. New R eproduction Dash Panel Assembly. To Clarify: The Center Dash A/C vent & driver's side lower vent (below the steering column)are NOT included. This was from a convertible and condition is very good. Convertible top pump connector has been cut off. Just remove the 2 pump wires from the harness if not needed for coupe application. The 2 wires are separate from the rest of the harness. These are usually broken, missing, or just plain ugly. Replace your old ones with the NOS Delco Knob Kit. 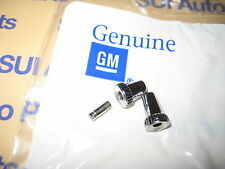 When only Genuine GM parts work, this is for you! Original 1960s era real deal authentic super cool rare GM CHEVROLET heavy brass padlock-made by best locks -rare original matching key -works excellent -for spare tire lock etc -used with wear as shown but authentic and working - - super nice addition to your rod --original accessory ----no reserve. Best Quality Reproduction Crystal Clear Lens Properly Molded To Fit Original Style Housing The instrument cluster lens on your Chevelle has probably seen better days. Over time they can become cloudy or brittle and break altogether. Cloudy, scratched lenses will not work for your Chevelle restoration. Replace your gauge lens today with this quality reproduction part from Ecklers. Chevrolet Chevelle, El Camino (1965). Restoration Correct Save By Buying The Complete Kit! Complete Dash Bezel Kit Kit Includes: Speedometer Bezel, Radio Bezel And Glove Box Name Plate Speedometer And Radio Bezel Have Chrome Finish 1966 Chevelle Super Sport is a true classic muscle car. Ecklers Chevelle offers this high quality Chevelle Super Sport Dash Bezel Kit. 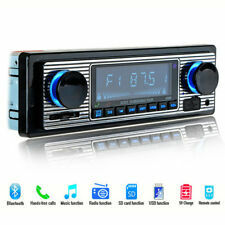 This kit is made up of speedometer bezel, radio bezel and glove box name plate. The speedometer and radio bezels are chrome plated, for a durable long lasting finish. This kit is the perfect way to complete, or update your interior. Old dealer info on back -3 digit phone number shows its age -used good - - super nice addition to your rod --original accessory and not a repop ----no reserve. SS Dash Assembly. New R eproduction Dash Assembly. To Clarify: The Center Dash A/C vent & driver's side lower vent (below the steering column)are NOT included. 1970 - 1972 Chevelle / El Camino Super Sport models. WILL NOT FADE OR SHRINK. 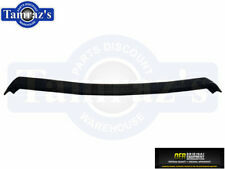 RZ'S CUSTOM DASH COVERS HAS BEEN MAKING DASH COVERS FOR OVER 35 YEARS.WE CUT AND TRIM ALL VENTS. ALL DASH COVERS ARE CUSTOM MADE.WE USE A HIGH QUALITY POLYESTER CARPET WHICH. This is a set of lower dash heater vents from 1976 Chevy Monte Carlo that I parted out. These are in really good shape for the age but the long vent does have some broke off mount tabs. Be sure to check out all my auctions, thanks. This is a 1964 Chevelle Dash cluster with the clock. Very nice overall condition. Best Quality Chevelle Custom Instrument Panel For Custom Gauge Panel Applications 4 Pre-drilled 2-1/16" Holes For Fuel, Temperature, Voltmeter...etc 2 Pre-drilled 3-3/8" Holes For Speedometer & Tachometer Allows You To Use Any Style Autometer, Stewart Warner Or Any Other Aftermarket Gauge Your 1970, 1971, 1972 Chevelle or Malibu instrument cluster panel may require replacement after years of wear and tear. Overtime, the elements take their toll. The years can be quite harsh on your classic's interior. This is a Very Hard to Find Original Main A/CLower Dash Vent from a 71 Malibu Chevelle. Part # 3967958. 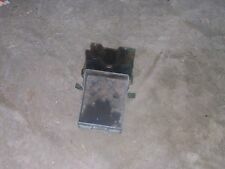 This is a lower dash heater vents from 1974 Chevy Monte Carlo that I am parting out. It is in good shape but does have one broken mounting tabs.Be sure to check out all my auctions, thanks. Chevrolet Chevelle 1970-1972. Installation is simple, requires no special tools, and can usually be completed in less than an hour. There is no need to remove the factory dash to install the overlay. 1966 Chevrolet Chevelle Malibu Goodmark - DASH PANEL PATCH UPPER 57in X 2in BETWEEN DASH AND WINDSHIELD. 1967 Chevrolet Chevelle Malibu Goodmark - DASH PANEL PATCH UPPER 57in X 2in BETWEEN DASH AND WINDSHIELD. Chevrolet Chevelle & El Camino (1969). MONTE CARLO, CHEVELLE, EL CAMINO, SS. YOU ARE PURCHASING A 1971 1972 CHEVY INNER RADIO KNOB BEZEL WITH TAB. GREAT CONDITION.